Not food leftovers. This is all that needs to go downstairs yet from the holiday hub bub. 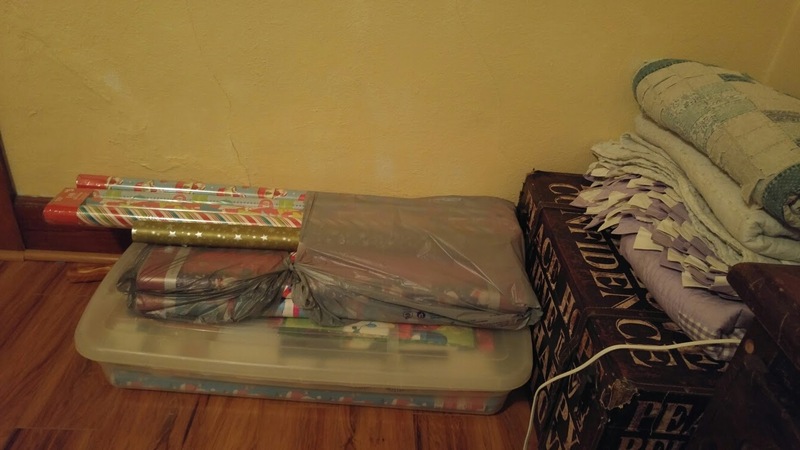 I have wrapping paper and boxes on the bedroom floor still. 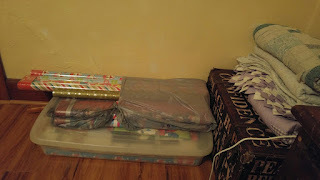 This year I used up quite a bit of wrapping paper and I was happy to be able to buy more at the end of the year. However, I didn't realize that some of the new rolls I bough were longer than my storage box! sigh. Oh, well, they will just have to lay on top of the box. I may get one of those tall storage containers eventually for wrapping paper, but for now, this is fine. See the purple quilt on the chest? That was a quilt my grandma made for me many years ago. It has "chicken scratch" embroidery panels on it. Gram made one in purple for me and one in pink for my cousin. It has seen a lot of use. We throw it on the bed for extra warmth when needed.